One big job I’ve wanted to tackle since moving in is cleaning out the rain gutters. For some reason, presumably leaves and debris, they overflow when it rains yet hardly any water actually exits the downspout. Holy guacamole, they were crammed to the hilt with copious amounts of leaves and sludge. The previous owners apparently tried to remedy the leaves situation by installing some leaf guard mesh stuff. 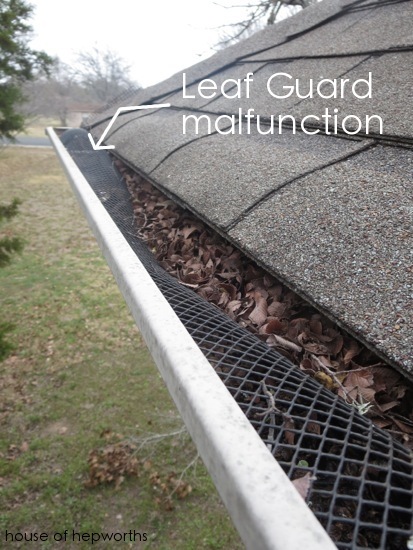 I’m sure at one point it worked great, but after years of rotting in the gutters, it had caved in on itself and leaves filled up on top of it – pretty much defeats the purpose of the leaf guard. I grabbed a small shovel trowel (I totally had to google that. I’m obviously not a gardener!) and got to work digging the built up sludge. It was mainly leaves, but also a sludgy material on the bottom consisting of decomposing leaves, dirt, and lots of gravel-looking stuff that came off the shingles. Once the bulk of the gross stuff was cleaned out I figured the best way to clean out the rest of the gunk was to just wash it out with the garden hose. It worked perfectly, probably considering the gutters were made for, well, water. Dur. 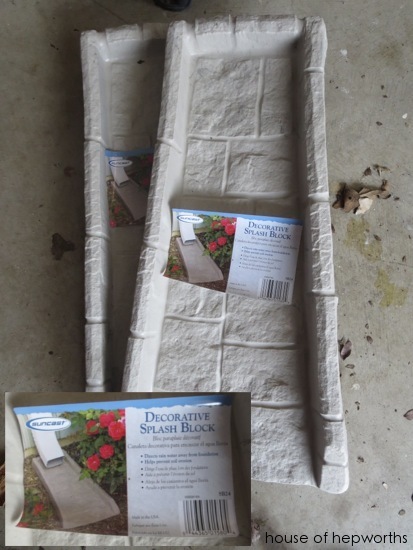 I snagged a boat load of Snap-In Gutter Screens and several Decorative Splash Blocks. 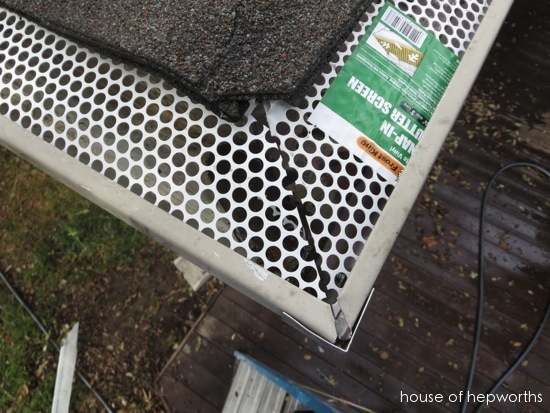 My goal with the Gutter Screens is to block all leaves AND SQUIRRELS from getting in the gutters. Random side story: Ben’s grandma used to live in Arizona, and she was obsessed with squirrels. She said they didn’t have any where she lived. I used to laugh when she would come visit and flip out over squirrels because we have TOO MANY squirrels here and they are a nuisance. Squirrels and deer, oh my word. The weather finally got nicer and the clouds parted and it was time to install the Gutter Screens. I was a tad naive in my excitement. I installed the first one and got a big ol’ womp-womp. They were too big. Oops. 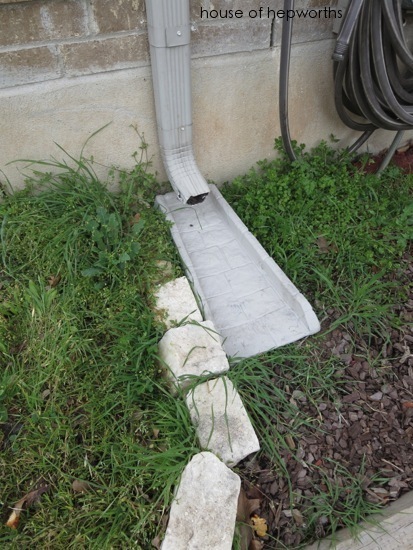 I guess not all gutters are created equally. Should have measured before buying! Lesson learned. Never one to take no for an answer, I decided to cut them to size. Seemed like a logical option. Worked like a charm. It’s almost like it was meant to be. Except the edge looked terrible. So I just tucked it under the lip of the gutter. To be perfectly honest, I like my way of installing them even better. They are suppose to sit on top of the gutter, but they seemed so floppy that way – like they might fall off, and tucking them under really wedges them in and makes them feel very secure. After the first guard was installed and cut while in place, I wised up and realized it’s much easier to cut them before installing them. If you ever install these in your gutters, cut them first, then install. Okay, so lets talk about the installation process. 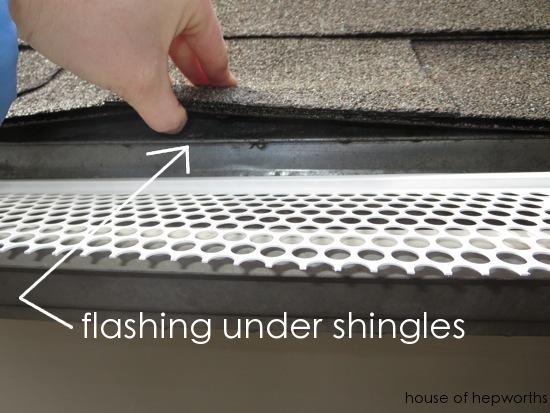 The Gutter Screens have a clip-like edge on one side that clips snugly around the flashing under the shingles. What is flashing? I’m so glad you asked! 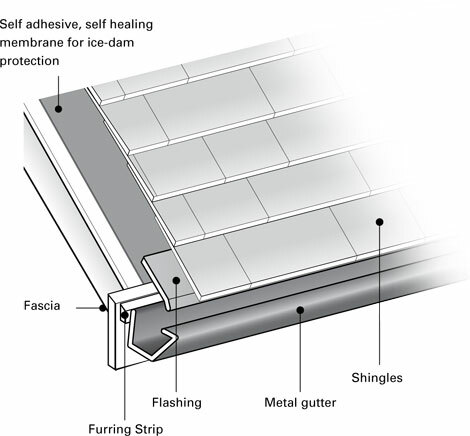 Flashing is sheet metal installed at any break in a shingled roofline to prevent leaks. I found this nifty diagram that shows you exactly where your flashing is located. 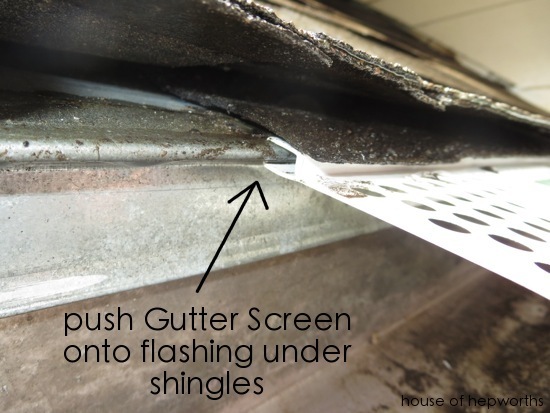 Here’s a close-up of the Gutter Screen attached to the flashing under the shingles. It took a little maneuvering around the shingles to get the guards on, but once in place they fit like a glove. The corners were a little bit more tricky, but honestly, they ended up being my favorite part of the installation because they broke up the monotony of installing guard after guard. I just cut the guard at a 45 degree angle (totally eye-balled it) and popped it in. And a perfect 90 degree angle right there folks. Here they are, all installed and looking fly. Is it weird that I get giddy-excited and proud when I look at the corners? Ya, it’s probably weird. Just pretend like I didn’t say that. Ahem. Oh, check out the Decorative Splash Block below the corner. I totally got both items in the same photo. Speaking of the Splash Blocks, not only are they “decorative”, they also are functional and help direct water away from your foundation. Had the gutter down spouts not been totally clogged with gross leaves before I cleaned them all out, water would have been drowning our foundation which is apparently not good for it. I figured if I was going to clean out the gutters I better direct all the future rain away from the foundation a la these handy splash blocks. Are you ready for outdoor Spring Cleaning? 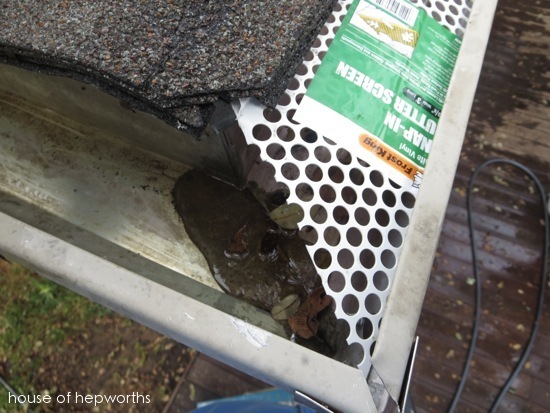 How often do you clean out your gutters? Ever? This is the first house I’ve ever owned that had gutters, so this was a new experience for me. 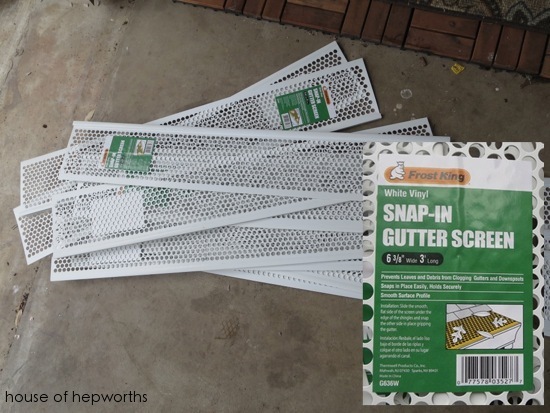 Hopefully the new gutter guards will keep all the gunk out of the gutters so I don’t have to clean them out again any time soon! to answer your question. four times a year: before/after rainy period in fall and again in spring. In my last house I only did it 2x/year and that was more than enough. I totally need to do this but I’m also totally afraid of heights and our house is 2 stories. Any suggestions? Did you stand on a ladder or scaffold? I can’t tell from the photos. It’s something that bothers me a whole lot and not my hubbie so I think I’m going to have to do it but wow I may have to tie myself in somehow. Rebecca, hire someone to do it. It’s much too dangerous to go up high on a ladder if you’re nervous about it. Check around with family/friends for a handyman that they can recommend, and have him do it. Hi, Allison. I have a couple of bonus suggestions that might help out you and your readers. 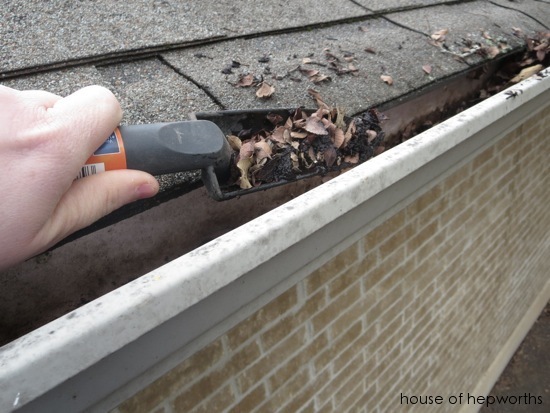 I think it’s a good idea to wear some kind of a glove when you are scooping out all of that grody gunk just in case there are spiders or other critters in the gutter. Also, if you are sensitive and/or allergic to dust and whatever else is in the gutter, you might want to wear protection over your eyes, nose, and mouth.. I wear gloves, but not the mask. P.S. I actually looked up grody in http://www.dictionary.com, and it’s a word. Nice to know after I’ve been using it all these years. Great idea. I would have had to remove those sticker labels on them though! LOL!! I am completely in the dark as to whaat is going to prevent the cut edges from collapsing into the gutter the way the old ones did. Looks like you did a pretty good job and I am afraid I might have chickened out after a few trips up and down the ladder. before my MIL passed away, she was adamant about not wanting her trees trimmed properly to keep the rodents and leaves off her roof so my hsb got to do a major cleanout at least once a year. We run across all kinds of things in our business. 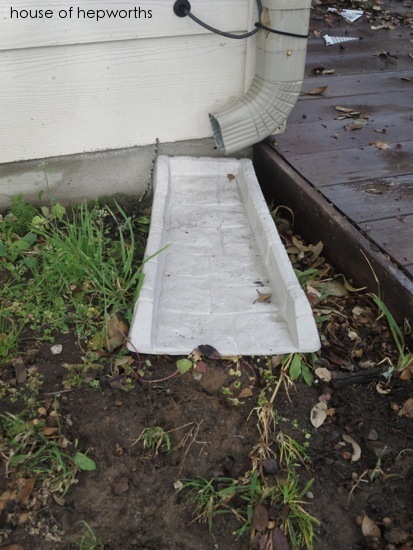 Even with gutter covers you will still need to clean your gutters from time to time. You did buy the only type that I recommend after seeing dozens of different styles. 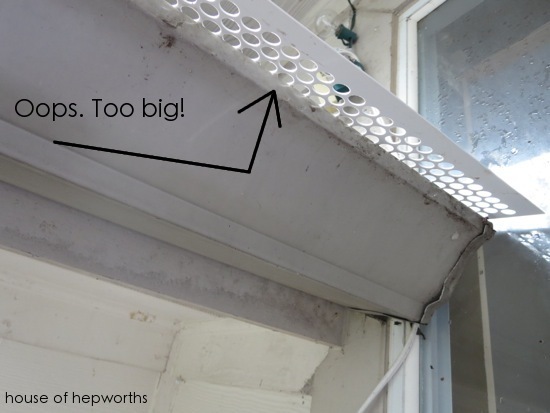 The problem is that small seeds and blooms will still fall into the gutters through the holes. So every few years you will probably still need to clean them. 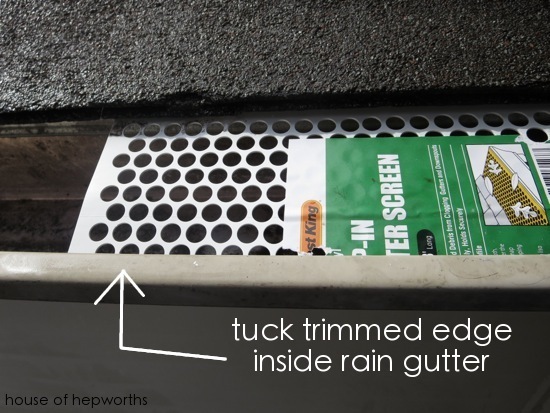 Or just take out one section and flush the gutter with a hose. DIY options can be so helpful for some home improvement projects, but this isn’t exactly one of them. 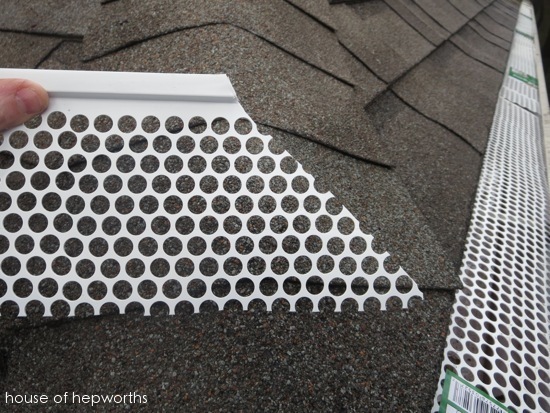 I’d caution against installing *anything* under your shingles, as this can void or limit your roofing warranty. You may actually end up spending *more* in the long run if you need repairs done to your roof. 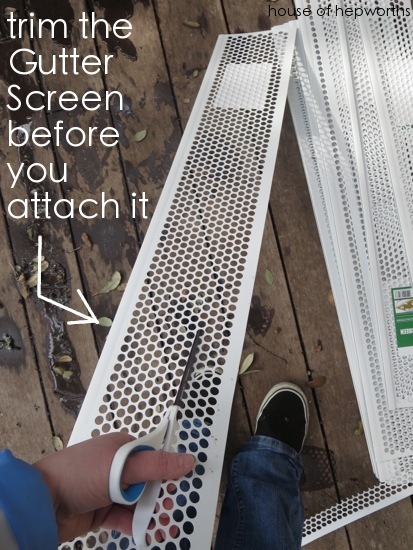 As another poster here mentioned, it’s also likely that seeds and whirlybirds will get stuck in those little holes on the DIY product. 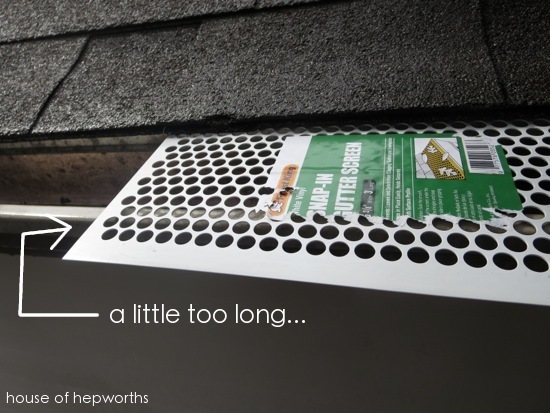 The professional LeafFilter micro mesh system is a great option because it’s completely enclosed, almost like a lid on a box. 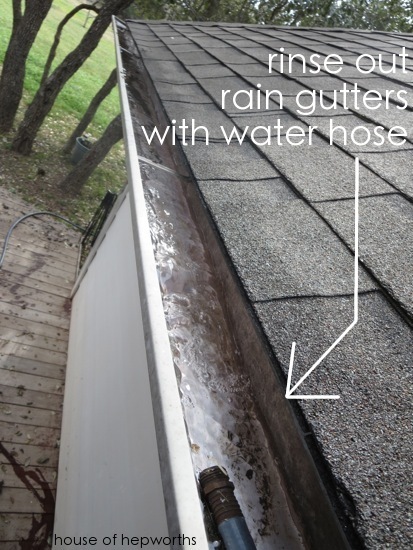 It will prevent everything but liquid from getting into the gutters — not even a grain of sand can get in. 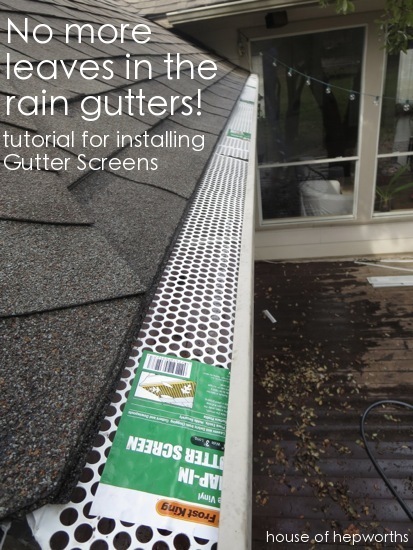 You’ll finally get to say adios to gutter cleaning altogether! Um, I just did this on my gutters. I think if you would have put them in correctly they would have worked. 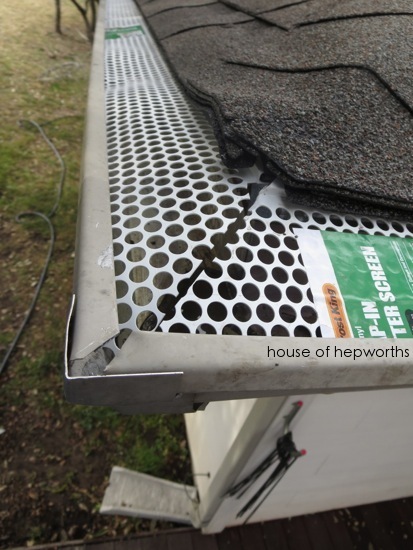 First off that lip that you stuck under the shingle is actually the side that would clip onto your gutter edge. 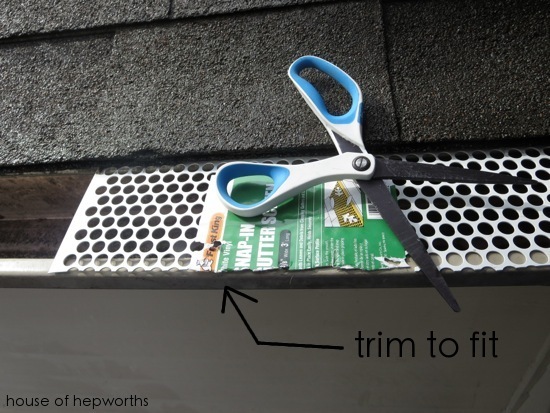 The flat side you trimmed off would go under your shingle. Was almost sold on these and then found out that acorns do get in them and bees and hornets do love making nests in them. There’s no way to take the cover off to clean out that sort of stuff? 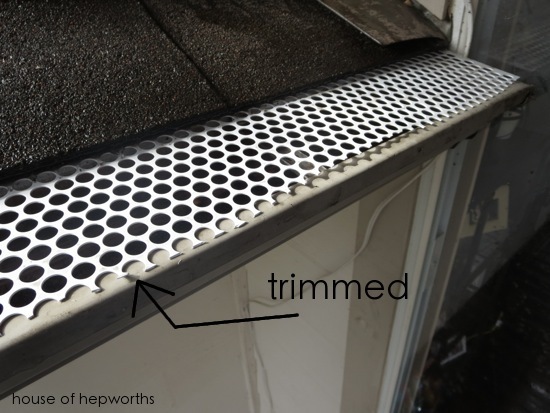 Gutter protection is important kids! It saves so much future time and energy. 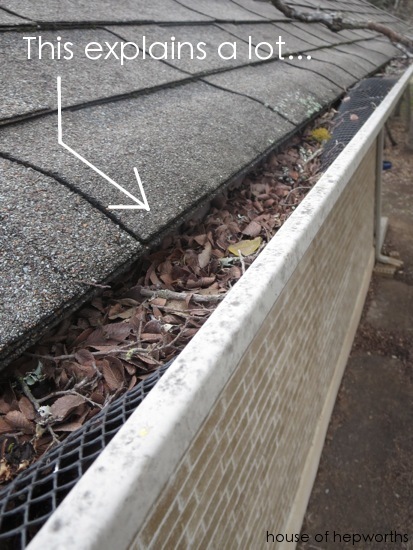 Blocked gutters can cause so many problems, overflowing, roof leakage. 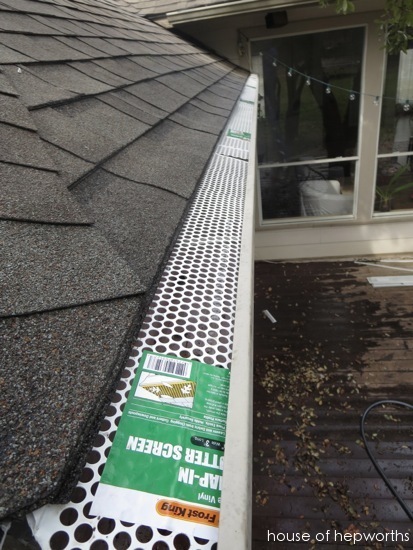 And those are much more costly than simple gutter protection. I always advise clients on purchasing gutter protection whenever they ask for advice on their guttering systems, great job.